In Las Vegas, 1969, you had the choice of witnessing either Elvis Presley, Tom Jones or Bobbie Gentry putting on the style. All were star attractions. 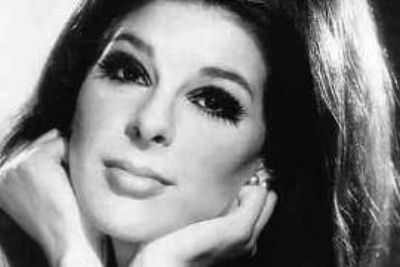 Yet while the King became immortal and Jones The Voice went on to continually re-invent his crimplene soul, Bobbie Gentry has vanished from sight. She hasn't given an interview in over thirty years and has barely entered a recording studio since releasing Patchwork in 1971, the last of her half dozen albums. She was born Roberta Lee Streeter on July 27th 1944 to Portuguese parents in Chickasaw County, Mississippi. Her parents divorced when she was a toddler, and it was left to her grandparents to raise her. They lived on a farm in Chickasaw County - Mississippi Delta country. "We didn't have electricity, and I didn't have many play things," Bobbie recalled. "My Granddaddy liked possum stew, so whenever he caught one, he'd cut off the tail for me to play with." Her Grandmother provided a toy that had a more long lasting impact when she traded a milk cow for a neighbour's piano. Bobbie taught herself to play by listening in church, and precociously had her first song in the bag by the time she was seven: My Dog Sergeant Is A Good Dog was later wheeled out as part of her nightclub act and survives on a BBC TV show. The rest of her oeuvre would be hugely influenced by her dirt poor, woodland community upbringing. After grade school in Greenwood, Mississippi, where her father lived, Bobbie moved to California in 1957 to live with her mother. She attended school in Arcadia for two years before the family moved to Palm Springs, by which time she had taught herself to play the guitar, banjo, bass, and vibes. One afternoon, she caught the King Vidor movie Ruby Gentry in which Jennifer Jones plays a Southern girl from the wrong side of the tracks who falls for local land owner Charlton Heston. It was melodramatic fare, but also undeniably sensual for a 1952 Hollywood movie. Bobbie was so impressed she decided to change her name. At 15, Bobbie Gentry was performing in a local country club, an act which was caught - and apparently encouraged - by Bob Hope and Hoagy Carmichael. Straight out of high school, she worked in Las Vegas as part of a nightclub review called Folies Bergere to raise a little cash, which then saw her through a degree in philosophy at UCLA. Transferring to the Los Angeles Conservatory of Music she studied guitar, majoring in theory and composition. All this time, Bobbie was playing in local venues, scrabbling for cash, some of the time as part of Hawaiian musician Johnny Ukulele's troupe of girls. Her only known recordings from the period were Ode To Love and Stranger In The Mirror, two 1964 duets with singer Jody Reynolds, who had scored a hit in 1958 with the death disc Endless Sleep. 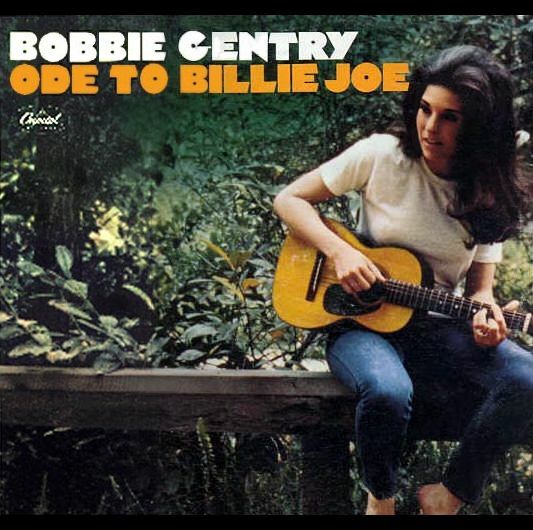 Early in 1967, Bobbie made a demo which came to the attention of Capitol Records producer Kelly Gordon. He liked the songs immensely, especially one called Ode To Billie Joe. The song was around seven minutes long, and it's eerie, mossy, swamp-country atmosphere was unlike anything Gordon had heard before. With support from Capitol's number one producer David Axelrod, he was able to sign Bobbie. Her first single was one of the other songs on the demo, Mississippi Delta, but pretty quickly DJs picked up on the flip side. Ode To Billie Joe, truncated to four minutes and made eerier yet by Jimmy Haskell's string arrangement, entered the Billboard Hot 100 on August 5th 1967. Two weeks later it was in the top ten: a week after that it was number one, dislodging the Beatles' utopian All You Need Is Love. No other debut single had made the top faster. No question, it was a unique record, and even the flower-waving underground had to be riveted by the narrative. Elliptically evocative, loaded with mysterious place names like Choctaw Ridge and the Tallahatchie Bridge, this smalltown apocalypse came across like The Waltons in reverse. It sounded entirely believable, autobiographical even. The central mystery of the song - probably lost in the edit - was what exactly the young couple threw from the bridge. After much discussion in the press, in cafes and pubs (it made the UK Top 20 in the autumn), the least controversial conclusion was an engagement ring. Overnight, this unknown country folk singer, her hair piled up like a downhome Priscilla Presley, had crossed the tracks just like namesake Ruby. True to the movie script, she had also begun an affair with Kelly Gordon, who left his wife and kids for his protogee. The two quickly amassed tracks for an album named after the hit, all original material. It hardly sounds thrown together. 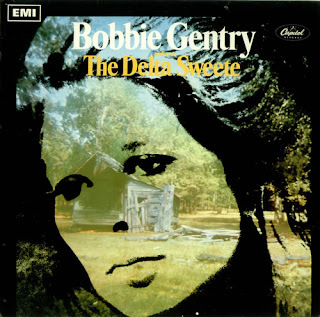 Mississippee Delta, the rejected A-side, is gritty, and would give Tony Joe White a run for his money in the southern stew stakes; Sunday Best and Papa Won'tcha Let Me Go To Town were sepia prints of a south that probably didn't exist by 1967 but surely did in Bobbie's childhood. The follow up to Ode was ill advised, though - I Saw An Angel Die was kaleidoscopic, vague, and quite beautiful, but it was way too unstructured for radio and bombed completely. This didn't affect the huge sales of the album, or the year-end impact of her number one single: after selling 3 million copies it won Bobbie three Grammy awards, including Best New Artist (she was the first country singer to win in this category); Billboard, Cashbox, and Record World nominated her most promising new vocalist; and Nashville's Country Music Association asked her to co-host their awards show with Sonny James. Life magazine even ran a feature on her grandparents' farm - the money she'd made from the hit had enabled Bobbie to buy them new trucks. Next came The Delta Sweete. This took the Ode album on a step - it was a segued, multi-textural album about the south, and maybe her best record. Standouts were Courtyard, a delicately terrifying morality tale of wish fulfillment, and Morning Glory, cheeky and playful, with Bobbie's voice at its breathiest and most sensuous. Dotted around the album were choice covers - quite obvious, but still flavoursome - of Tobacco Road, Parchman Farm, and Louisiana Man. The oak-aged Okolona River Bottom Band had presaged the album as a November '67 single, but only reached 54; Louisiana Man, backed by Courtyard, fared even worse and spent a solitary week at number 100. Capitol took swift action - they weren't about to let such a hot property slip off the map, and Bobbie had two more albums out by the year's end. Local Gentry compromised some of her best songs (the saucy Sittin' Pretty, and deceptively airy, black-humoured Casket Vignette) with a bunch of more contemporary covers, including Fool On The Hill which became another flop single. There was also a definitive, curled-up-in-a-cosy-cabin take on Kenny Rankin's Peaceful. The striking red trouser suit and confident stance on the cover must have shifted a few copies of Local Gentry, too. Stanley Dorfman at the BBC was certainly impressed and offered Bobbie her own series, with guests including The Hollies and Donovan. Hits or no, at home she also regularly featured on TV. Something of a good luck charm, she was the maiden guest on Glen Campbell, Johnny Cash, and Bobby Darin's variety shows. 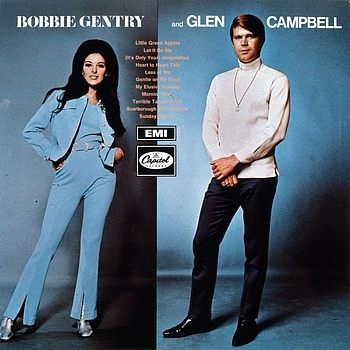 Towards 1968's end, Bobbie was teamed up with Capitol's other top country-pop crossover act, Glen Campbell. Somehow their album of duets rarely sounded more than perfunctory, in spite of great arrangers and another eye-catching cover. No matter, a version of Mornin' Glory - nowhere near as good as the Delta Sweete version - charted, and Let It Be Me, the old Everly Brothers hit, went to 14 on the country chart and restored Bobbie to the Top 40 for the first time in a year. The Gentry live show was by all accounts more of a rocking affair than her records let on, and the 1969 album Touch 'Em With Love certainly shifted up a gear. The polished brass of the title track failed to chart as a single, but a version of Bacharach and David's I'll Never Fall In Love Again - with Bobbie's voice straining in an endearingly high register - charted all over Europe, making it all the way to number one in Britain. This was followed by the Top 3 All I Have To Do Is Dream, another Everlys-originated duet with Glen Campbell. Back home, Bobbie got hitched to casino magnate William F. Harrah - she was 25 and he was 58. It lasted three months. According to Mojo magazine Harrah, who was none too impressed with his young wife heading out on tour, followed her to a theatre and caught her in flagrante backstage. Maybe he should have listened to Courtyard before he signed the wedding contract*. All of which made Fancy, her last single of 1969, seem more than a little autobigraphical: "Just be nice to the gentlemen, Fancy, and they'll be nice to you." Produced by Rick Hall at Muscle Shoals, it made the US Top 40 but felt bigger. Reba McEntire scored hugely with it in 1991, and apparently the film rights have since been doing the rounds for the story of a girl who "might have been born just plain white trash but Fancy was my name ... and I ain't done bad." Bobbie certainly hadn't. With the smarts as well as the sass, she set up her own publishing company, Super Darlin Publishing, and television production, Gentry Limited. Her purchase of a percentage of The Phoenix Suns basketball team in 1969, as well as vast tracks of land in California, made her a wealthy woman. Somehow, she also found time to record a stack of songs that remained unreleased, including Show Off, Donovan's Skipalong Sam, and the exquisite Smoke, unavailable until recently and all recommended. In 1970 Johnny Cash introduced her on TV, singing Fancy, as "our Mississippi River Delta Queen, Bobbie Gentry." Internationally, she had now consolidated after her first instant rush of fame and was a genuine star. In Vegas she had a million dollar contract. "I write and arrange all the music, design the costumes, do the choreography, the whole thing," she said. "I'm completely responsible for it. It's totally my own from inception to performance. I originally produced Ode To Billie Joe and most of my other records, but a woman doesn't stand much chance in a recording studio. A staff producer's name was nearly always put on the records." Fame doesn't get more glamorous than aftershow parties with Elvis, yet a melancholy single called Apartment 21 that summer suggested she was beginning to feel trapped by it. These feelings were made more explicit on her final album, 1971's Patchwork. Written and produced by Bobbie (this time, with full credits), it featured southern characters like Benjamin, Billy The Kid and Belinda who hadn't been around since The Delta Sweete, as well as Miss Clara and Your Number One Fan, both flapper skits, the latter aimed at her more dottily devoted supporters. Marigolds And Tangerines betrayed a yearning for a simpler, sweeter life; Somebody Like Me had a soulful strut; Lookin' In was effectively a resignation letter from the world of pop. 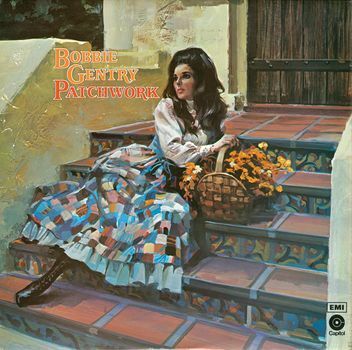 Bobbie has since said that, of all her records, she is most proud of Patchwork and it's not hard see why. guest on The Tonight Show with Johnny Carson. 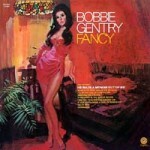 Since then Bobbie Gentry has never performed, sung, or given an interview. From the very beginning, Roberta Lee Streeter seemed to know exactly what she wanted, and had the charm, skill, and talent to get it. Five years of recording took her from a Mississippi farm to Vegas and riches beyond most people's dreams. Then, simply, she got bored, poured her artistic ambitions into one last album, and quit while she was still at the top. Her catalogue is almost faultless. As a blueprint for ambitious feminists, the Bobbie Gentry story is hard to trump. Supermarket sightings are frequent enough these days. Starstruck fans report that her raven mane is still unmistakable. She's no hermit**. It's just that Bobbie Gentry knows exactly how to keep her legend bottled, her image unruffled, and her music timeless. * It is often assumed that Bobbie managed to retire a wealthy woman after she divorced Harrah, receiving a $3.5 million settlement. Accusations of gold-digging are derailed by the fact she made over $3,000,000 in royalties from Capitol alone. Bobbie also made millions from her Vegas stints which lasted on and off until 1980, and an alleged $4,000,000 when Warner Brothers optioned Ode To Billie Joe. **Here is a comment on a Bobbie Gentry thread from Tom Ewing's Popular blog: "I heard a touching story about Bobbie from the 1980′s. A couple years after her retirement, one of her Vegas male dancers became ill with AIDS. His lover told me they were penniless and about to be evicted from their home. Even though she was raising a newborn son as a single mother, she stepped in paid the bills and got her friend the medical care he needed. In an era when some people would not touch somone with AIDS she came to the hospital, held his hand and comforted him. She even paid the funeral expenses and made a terrible situation a little more tolerable for a dear friend. "